The Durant family planted their first vineyard in the Dundee Hills of Oregon in 1973. As pioneers in the Oregon wine industry, the Durant family has supplied grapes to select premier wineries in Oregon ( Domaine Drouhin, Sokol Blosser, Lange Estate, Bergstrom, Ponzi Vineyards, Hamacher, ADEA, Cottonwood, White Rose and Owen Roe), and produced notable premium Pinot Noir, Pinot Gris and Chardonnay from estate grapes. Over 60 acres are dry-farmed. The first Durant Vineyard wine was released in 2003. 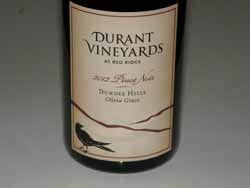 Durant Estate Pinot Noirs are vinified by different wineries (in 2008, LaCasita Vineyard by ADEA Winery, Southview Heron Vineyard by Aaron Hess, and Southview Lark Vineyard by Dobbs Winery). For a private tasting or to order wine, phone 503-864-8502. The estate is open Memorial Day and Thanksgiving weekends.